Chantale Fiebig is a partner in the Washington D.C. office of Gibson, Dunn & Crutcher LLP. Her practice focuses on complex civil litigation in federal court. 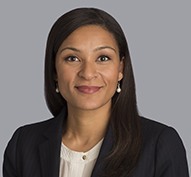 She has significant experience handling high-stakes cases on behalf of a wide range of clients, including global banks, financial and professional services firms, private equity firms, consulting firms, technology and engineering companies, and large government contractors. Ms. Fiebig has substantial experience at every stage of commercial litigation, including through trials and appeals, and has successfully litigated or resolved matters for her clients involving a broad range of substantive legal issues, including disputes arising under the federal securities laws; the Sherman Act and state antitrust statutes; the False Claims Act; the Carmack Amendment; and California, New York, and other state consumer protection statutes. Ms. Fiebig also has substantial experience litigating consumer class actions, particularly relating to products that are heavily regulated. She has successfully defended claims against her clients involving branded pharmaceuticals, polyurethane foam, automobiles, and food and beverage products. In addition, Ms. Fiebig routinely represents corporate clients in high-value contractual and transactional disputes, including where litigation arises from contractual or business disputes with a company’s joint venture partners, competitors, large service providers, or executives and employees. Prior to joining Gibson Dunn, Ms. Fiebig served as an Assistant United States Attorney in the Eastern District of Michigan, where she focused on criminal appellate matters and was involved in the public corruption prosecution of former Detroit Mayor Kwame Kilpatrick. She also successfully represented the federal government in over 20 appeals, many of which she argued before the federal court of appeals. Before serving as an AUSA, Ms. Fiebig practiced with Simpson Thacher & Bartlett LLP in New York, where she represented corporate clients in antitrust and securities litigations. She attended Stanford Law School, where she was an articles editor on the Stanford Law Review, and received her B.A. in economics from the University of Virginia. She is Chair of the Litigation Committee for the Bar Association of the District of Columbia, and serves as an adjunct professor at Georgetown University Law Center where she co-teaches an advanced seminar on class actions.